Getting organized in your home can seem like an overwhelming task, especially if there’s a lot of chaos right now. There’s a few things that have seemed to help me over the last few years as a homeowner, and one major thing is to do one room at a time. Instead of trying to tackle cleaning and organizing your whole house in a weekend, work on one room a month. This month I want to tackle the mudroom, laundry room and front closet. Winter is coming.. though I’d like to try and ignore that fact.. and sometimes the bulky jackets, the scarves, mittens, boots (shall I go on?).. take over a closet and mudroom. I unfortunately don’t have a mudroom (this will definitely be something I would look for in another home if we ever opted to move), but I have a nice laundry room and a decent entry closet. 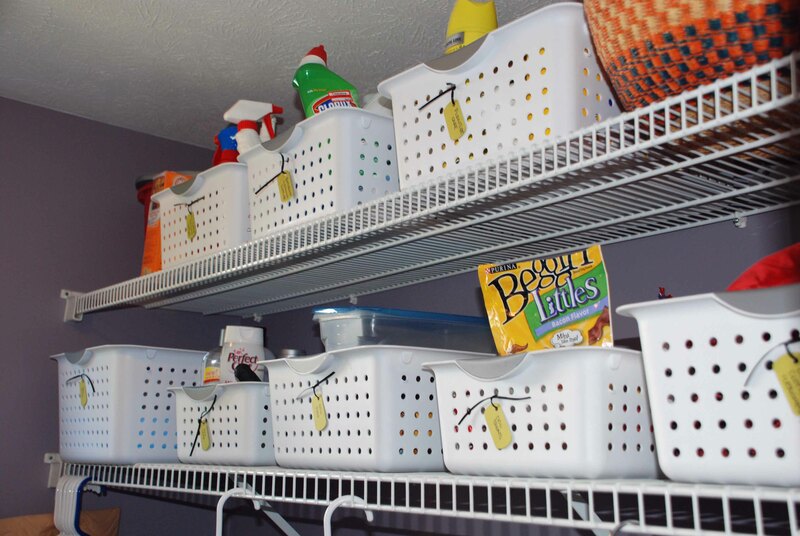 The best thing I could recommend for any organizing is bins or baskets, labeled of course. Start by separating items that belong to each member of your household. I’m always surprised when I do this how many things each person has that are duplicate.. I mean, really, how many scarves does one person need? In your closet or mudroom, give each member of your household a basket for their things. Limit the space that each person is allowed to have and frequently sort through the items, keeping only what gets used. If someone gets new things for a gift, get rid of the old instead of accumulating so much. This will make a huge difference in staying organized. One area that I definitely have not perfected yet is my shoe storage… I will be first to admit that keeping shoes in a perfectly straight line is not a normal occurrence, however my front closet does have something that helps this situation. 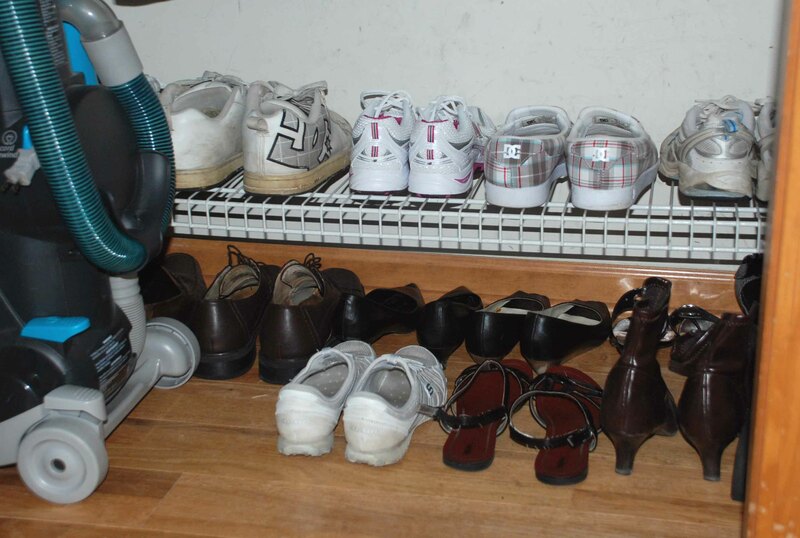 It has a wire shelf at the bottom, so add an extra level of shoe storage. Genius right? Not really, but it makes a difference! An who really has long enough jackets to take up that whole length anyways? Why not utilize the space? My front entry closet's extra shoe shelf. Now I keep my cleaning supplies and my dog supplies in my laundry room. I keep these things up on shelves because I knew eventually I would need to “keep them out of reach of children”. My cleaning supplies used to be under my bathroom sink just as a huge conglomeration of supplies with no logical order to them. Now I separated them into task oriented.. so all my bathroom cleaning supplies are together, furniture care is together and then all-purpose is together. This makes it so much easier to cart around a basket of cleaning supplies instead of juggling the five different cleaning bottles, sponges and cloths up the stairs just to clean my bathrooms. Plus now if there’s an accident or a mess made, I just pull down one basket instead of digging through the dark obis of cleaning supplies. Make tags out of cardstock and attach them to your baskets with ribbon so you can easily read what's in each basket! You can apply this to anything you have in these two rooms. One bin that I always love to have is my “pocket junk” for laundry. Anything that’s left in pockets goes in this basket. It is also my “the washer ate my sock” bin, so if a sock doesn’t have a pair, it gets put in the basket.. if that same sock doesn’t have a pair two weeks later, it gets thrown out. Target is my bff when it comes to organization things. All of the white baskets I got there. I believe they’re Sterilite brand.. now I don’t think they still have the curvy style, they’re more square now, but they work great either way. They’re decent looking, they’re easy to clean if anything spills on them and they have holes in the side so you can kind of see through them without things being able to fall through. -If you have dogs, put their food in smaller plastic containers, such as Glad. This eliminates the need to dig in a huge bag of dog food and makes it much more portable. -If your dog bowls are in either of these rooms, use a placemat under them to prevent water/food from getting on the floor. Just get an inexpensive plastic mat, nothing fancy! -Got plastic bags? Use a storage unit for them to keep them from piling up. If you want something fancy, these are available on Amazon, or I bought fabric ones that hang from the dollar store that work great! -Use the reusable bags? Good for you!!! Use a hook (like you would for coats) and hang them. This makes it easy to access them and keeps them out of the way too! -Shelves, shelves and shelves.. If your home has extra wall space, add shelving! In my laundry room I have 16″ deep tight mesh wire shelving. This is really nice because the wire is closer together (more like a pantry), and deeper (12″ is standard depth). It’s a little pricier, but well worth it! -Hang your dust pan on the wall. Most of them have a hole in the handle, utilize it! -Use a plastic tray for wet boots in the winter. Make it look pretty by adding a layer of rocks, which also decreases puddles by allowing the water to evaporate quicker! -Use baskets for extras such as candles, hand soap, laundry care, etc. Even a “misc items” basket will help you feel more organized just by having stuff you really don’t know what to do with in one spot.